If you’re looking for the highest quality bike rack for your surfboard, look no further. 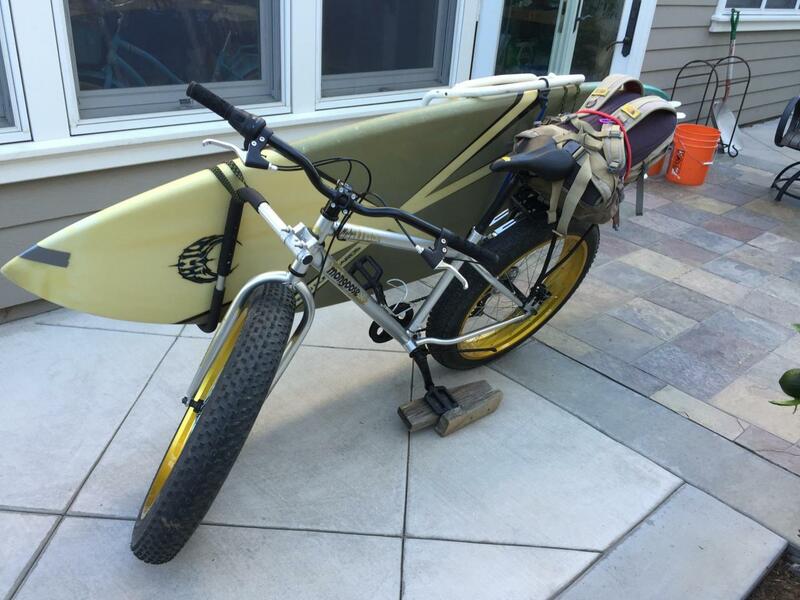 This side-mounted surfboard carrier offers the most user friendly and stable way for you to bike to the beach with your surfboard. Made of aircraft-quality aluminum, this surfboard rack was engineered to be as lightweight and durable as possible. 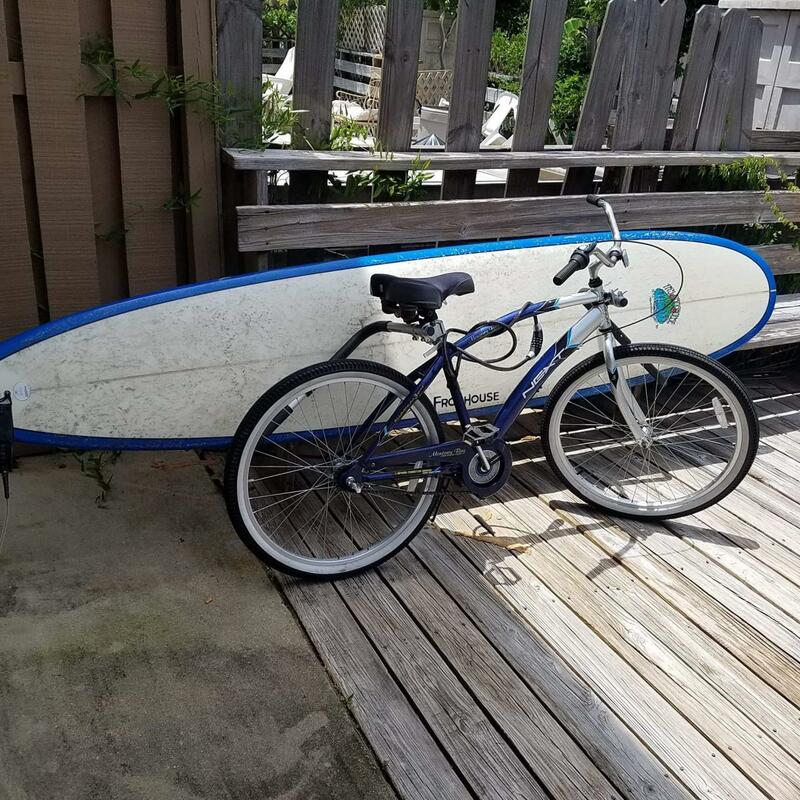 Whether you have a shortboard, longboard, beach cruiser, or bmx bike, this surfboard bike rack is designed to accommodate a wide range of needs. Spend more time surfing and less time looking for parking! Quick Release: if you want to ride your bike without the rack, removing it is literally a push of two buttons! A push button at each rack arm removes the arms from your bike; reinsert the arms whenever you're ready to load your surfboard again. How does it attach to my bike? The initial install of this rack is super easy! The rack itself is a set of 2 independent rack arms, 1 mounted at the front of your bike, and 1 mounted at the rear of your bike. (Keep in mind you won't be able to mount this on a bike with a front basket as it attaches where the basket is!) To begin, you simply secure the rack’s front U-clamp to your bike’s headstock (one of the strongest places on every bike). The clamp comes with padded rubber to protect your bike’s paint, and will fit a wide variety of head stock diameters. With the back clamp you have two options on where to mount it: the rear seat post or onto your bike’s preexisting rear basket (or metal splash guard). The rear rack mounting option allows this rack to accommodate a wider range of bikes and longer surfboard sizes. Have a shortboard? 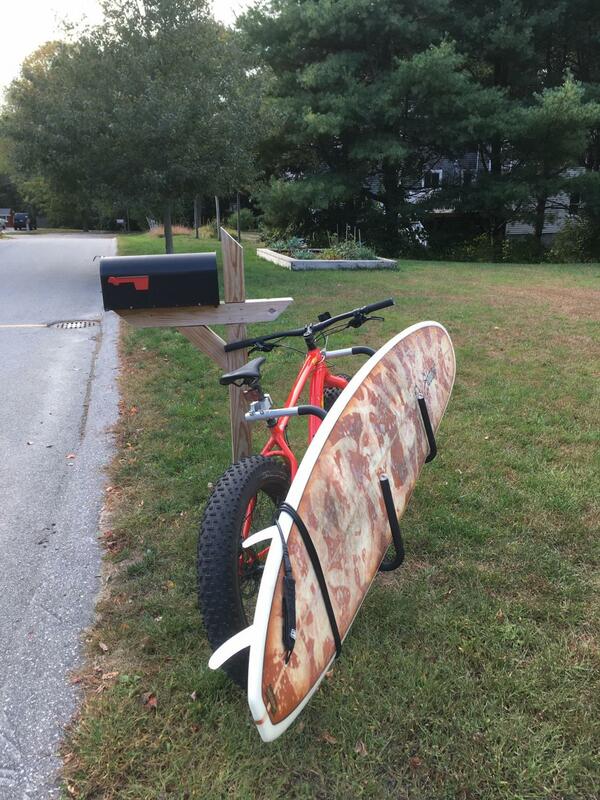 Check out the shortboard version of this rack: Shortboard Bike Rack. Holds boards up to about 20 lbs, up to 25 lbs if diligently mounted and right fit for bike/rider. Does *not* work on bikes that have a front tubes that is not circular, and that is welded to the bike's body, as there is nowhere to attach hardware. Tubes are pre-bent to hold boards up to 3.5 inches in thickness (if your board is a little thicker than that, the bars can be bent open a bit to make more room). I have a fishing boat I plan to use to go to remote places to surf, the clamps work on my T top to hold my longboard great. I had to find pipes on the T top similar to the size of a bicycle but that was no problem. I really love the fact that It is removable for when I only want to fish. This is a very solid rack that was easy to install with the excellent instructions. My recent trek involved parking at a state park and then biking 8 miles with my 9' longboard in the rack to the beach. The rack could not have performed better. This product will perform for years. Works great for short or longboards! Closest break I like to go to is about a 3 minute bike ride from my house. The racks work great and are easy to remove as well. Feedback is especially when I take the long board (10ft) the racks tend to jiggle a bit and get a little wobbly, which is understandable because of the push buttons it's not a rock solid hold. Also when the racks have a board in them, short or long, the bike will lean over unless I'm holding it or on it. I have a kick stand but maybe need to get a shorter one to offset the tilt - or maybe I'm kookin' it and this is normal (these are my first surf bike racks). Asides from that have had a bunch of fun sessions so far, saving gas, and would definitely recommend these racks to a friend! I really love my Long board rack and use it on my fat tire bike. I had to have them send me a special bracket to fit the larger front tube, but it works great! The arms are bendable, so you can adjust the width. The bike sill rides smoothly. Easy to remove the arms when Im not going surfing. Great product! Great rack easy to install. My 10' board fits on it to problem. I have a 9'6", and it holds my board perfectly; I ride a standard beach cruiser and its balanced perfectly. The installation was quick and easy, and the customer service was right on in answering any questions I had. My husband loved the surfboard bike rack and said it was easy to use, especially with it's convenience of the removable attachments. Thanks!! well designed and easy to use. Prefer this over other racks on market by far. Did a lot of research and happy with decision. Easy to install too. Decided to buy this and love it! I ride my bike fast and this rack is very durable and the way it is mounted on your bike it would make it difficult for someone to steal. I can store a long board, shortboard, and even boogie board on it with the dimensions. I could probably store two boards at one time if I tried. The only recommendation would be for new owner to purchase some extra foam for rack for big bumps, use a towel for bumby roads, or even "store your board" to provide foam but it is a really easy fix. Great product and I do not see it rusting. Was surprised at the price after visiting my local Surf Shop and easily installed it in a mornings coffee time. Having a beach bike with thicker bars , I did need to use the longer U bolt and trim tips,but only minor difficulty. I do like being able to use left or right mounting and have entertained the thought of using 2 mounts so I could take a long&short board at same time...I have to deal with changing conditions of N. Fla Surf...would take some modifications and another set of mounts.Good product,well thought out , very happy with purchase. I initially bought this product with a lot of concerns; would my board fit in the bike rack properly, would it bounce around and get dinged, would I be able to turn the bike and maneuver it while the board was in the rack, was it hard to assemble? All of my concerns have been resolved. Assembly was easy, the board is really stable in the rack, it is really easy to maneuver my bike. This is a great way to transport my surfboard, I love this bike rack!!!! Excellent product. I use it to transport my 8'6" SUP. There's a minimal flex of the rack in rough terrain. Easy install, very happy with it. I like it. It was easy to assemble and works like it should. Very easy to install once you have the right tools. The rack only took a little while to put together. I'm no engineer and it was simple to figure out what went where. My son is a lot more independent now. All quality parts, lightweight and strong and fit together very well. I have a beach cruiser and a 9 6 longboard. what model carrier should I buy? This removable bike rack for your surfboard is built to work for most bikes, and to be stable transport for longboards, at least up to a 9' foot board, but possibly a little longer. It has a quick release, so you can easily remove the rack's bars when you are not using them.It mounts to both the front of your bike (to the head tube) and to the rear. On the rear you have a choice of where to mount it -- to your seatpost or your rear bike rack. For a big longboard, mounting to a rear rack would be a good option. So the removable bike rack could work for your cruiser & long board, and would be an option. For comparison, another option would be the Carver Max. The manufacturer recommends that bike rack for larger boards, up to 10 feet long. 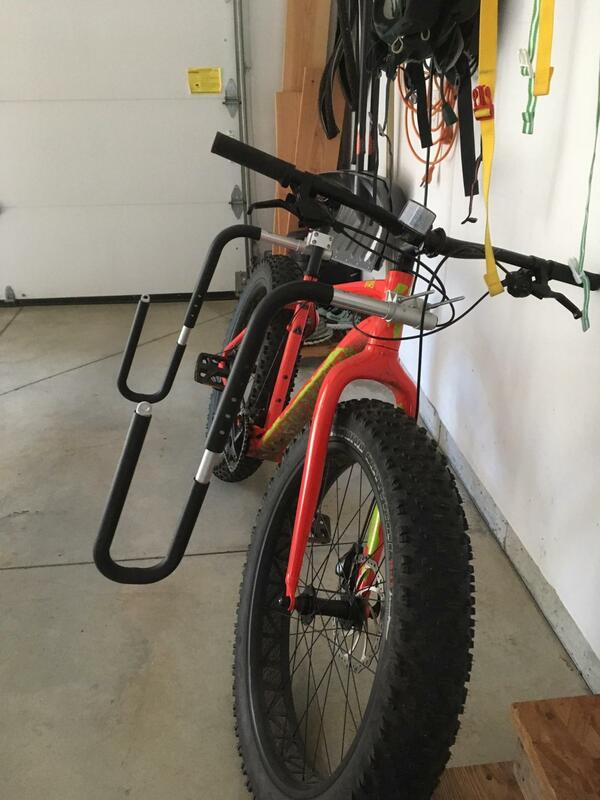 It works with cruisers and non-suspension bikes. The longboard rack mounts to the rear of your bike only. It does not have a quick release function like the other removable rack, however. Is it possible to just buy the clamps? I have a beach cruiser and a moped that I want to use this for, but will only need the racks for one at a time. Extra clamp sets are currently not available. However, this removable surfboard rack is really meant for bikes; mounting it to a moped would not be guaranteed to work, and the manufacturer does not recommend it for use on mopeds. It would work great for your beach cruiser though, if you wanted to try it out on that! And we also carry this moped rack for short or longboards, for your consideration. I just bought an inflatable paddle board, 6 inch thick. can you please tell me if it fits in your rack? 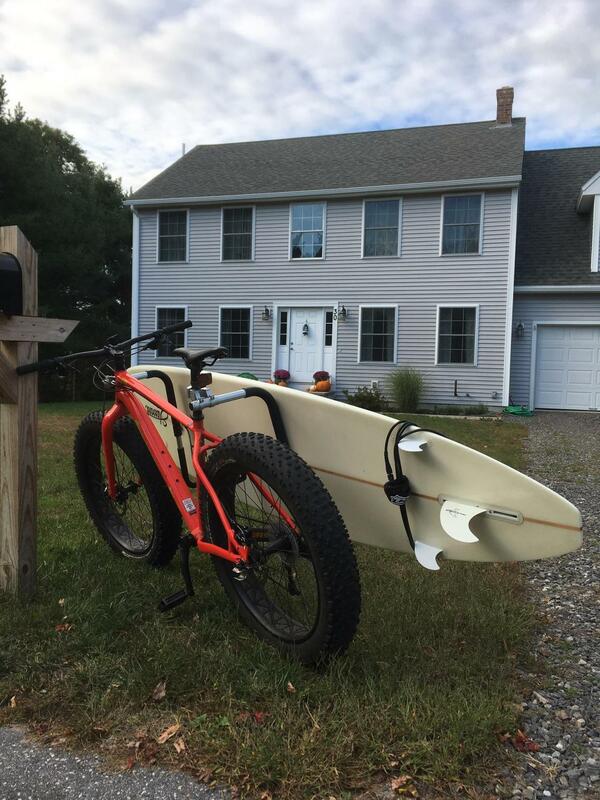 Our surfboard bike rack will not work for a Paddle Board (SUP) and there isn't an alternative SUP carrier for the side of your bike. Our SUP bike trailer would be an option for a SUP; it tows your SUP behind your bike, attaching to your bike seat, and you can also use the handle to transport your SUP when you are not on your bike. It works for most inflatable SUPs, as long as the inflatable SUP has a tapered end. The board needs to taper down to about 15 inches (38 cm) wide. Are the clamps also removable? Can I install this rack on a rental bike, and then easily uninstall the rack, without damaging the bike? Can I transfer the rack among different bikes? The rack arms that hold the surfboard remove with the push of a button -- but to remove the clamps you are basically uninstalling them, so would need to have a wrench on hand. The clamp has padding to protect your bike's paint, but I wouldn't guarantee you couldn't unintentionally scratch or ding a rental bike in the process of uninstalling it. However, you can transfer the rack system to another bike, but again, its a matter of uninstalling and installing, and making adjustments to how it fits a different bike, as you do need to adjust it some on different bikes. I have an 8'2" 18lb 4.5" wide SUP. I would like to use the side carrier- will your product work with my board? This bike rack is not recommended for SUPs, and your SUP is too thick for this rack, so it won't fit, and you wouldn't be able to adjust (bend) the rack to accommodate that thickness. Unfortunately, there are not many options for transporting a SUP on the side of a bike. This is because the shape of a SUP can make it much harder to navigate on a bike and a SUP can sometimes gets in the way of the handles. The alternatives are SUP racks that you tow behind your bike, as seen in theseSUP carrier listings. I see your comments about not using this rack for a SUP. What about a 6'10"or 7' 8" 3.5" thick SUP? A lot of the surf sups have trimmed down in size. This removable bike rack could possibly work for a SUP about the size of yours. At 3.5" thick, it should fit in the bike rack - but that is about the maximum thickness of a board that the bike rack can hold. Also the length of your SUP isn't that long, so that will help. If it happens to be a wide SUP (or very long ones), the shape of a SUP can sometimes get in the way of the handlebars, or have other issues taking corners, etc. That is going to vary by user, board and bike, but would be something to note. Otherwise, it most like will be fine for your smaller board. Will this work on a road bike with drop handle bars? It looks like the handle bar clearance might be limited while turning. 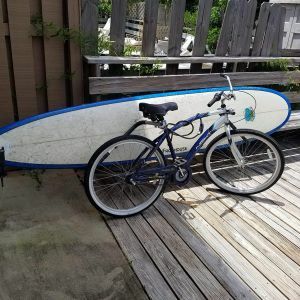 How well this surfboard bike rack will work with drop handle bars is going to depend on the size of the board and how it sits relative to your bike in the board rack. For larger boards, there can be problems with turning, etc., because the board doesn't clear the handle bars, etc. If you have already pictured that could happen with your bike & board, that is probably a good indication it might not work well for you. An alternative could be a board rack that you tow behind your bike which we have a couple of available in our bike/board rack collection here: https://www.storeyourboard.com/surfboard-bike-racks/. Have you seen anyone using this set up with a basket on the front? Is there any issues with the front wheel hitting the board? We seem to have one review say that this bike board rack didn't work with a front basket - they didn't provide additional information, so I am not certain if there were specific reasons or something variable on why it did not. That is the only time I have run into. The back clamp can attach to a rear basket, but that won't work for the front. The front clamp has to be attached to the front headstock for this bike rack. So once attached, if you have a basket up there, there are too many variables to know if it will get in the way, and as I said, it isn't clear if it is the basket getting in the way of the front mount, or something else. As to front wheel hitting the board, that doesn't seem to be a problem - but it may take getting used to. Turning can be trickier with some longer boards and that can be impacted by the type of handlebars, but otherwise, I think it is mostly a matter of getting used to having a side rack with your board on it, and your route to water. Will this rack work on a 10 Speed style bicycle? Our Surfboard Bike Rack could possibly work for a road type bicycle such as a 10 speed. The main possible issue could be how the board/rack sits in relation to you as a rider on that type of bike and whether or not there is any interference with, say, the handlebars. It is hard to judge though whether that would be an impact; but you may want to look at the rack and picture how it attaches to your bike, and your actual board - to see if you can imagine what it would be like maneuvering with the board on that bike. Additionally, you would need to make sure that you could attach it to your particular bike: the front mount attaches to the bike frame's head tube & the rear mount can attach to either the seat post (or rear cargo basket if one has one). Will this bike rack work on an electric bike with higher speeds/more wind while being transported? Our removable longboard bike rack is not recommended for use on electric bikes as it is not designed to handle the higher speeds/winds. I apologize that we don't have any recommendation similar to this rack that would work for your electric bike at this time. Is there a locking device or key to make sure the board hangers can not be removed and stolen? Our Removable Surfboard Bike Rack doesn't have a built-in lock to keep someone from removing the rack's arms; however, the quick release buttons to remove the arms only removes those cradles that would hold the board (for when you want to ride your bike but don't need to transport your board). It doesn't remove the actual hardware that attaches those arms to the bike, so the arms won't really be useable for much on their own, without that bike hardware...and someone would need some tools handy to remove the u-clamp and hardware elements from the front and rear of the bike, if they wanted to take the whole system off of the bike.